Docks Seals within loading dock systems are an integral part of any facility. Unfortunately not all Loading Docks are built the same. For this reason all dock Seals offered through Loading Dock Supply are custom built to suit your facility. With our short lead times and and expert advice were sure to provide you the best possible seal found on the market today, without the wait. 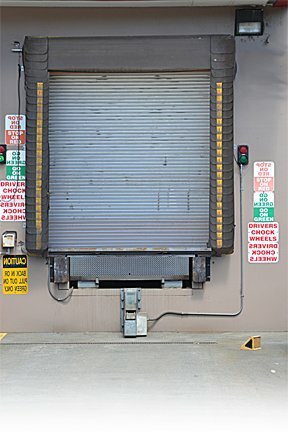 Working with your loading bay system Dock Seals & Dock Shelters provide environmental protection and a guide for trucks docking with your facility. Compressing between the trailer and wall dock seals effectively guard against outside environmental conditions, Insects, pests, & other variables which may pass between the truck and wall. Fill out a dock seal Survey today! High grade vinyl material comes in 22, 35, 40 oz gauges. Yellow guide stripes offset 3” from inside edge of verticals provides higher visibility ensuring accurate docking. Tapered bottom reduces pinching between trailer and dock bumpers when compressed. 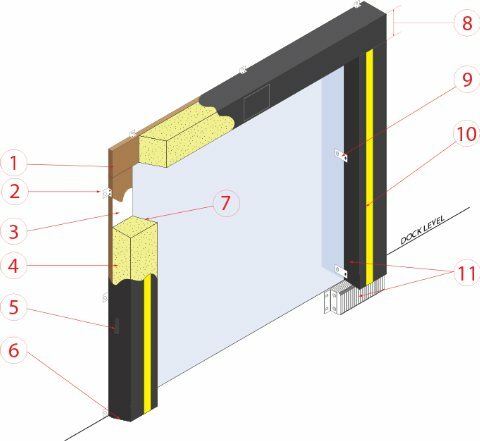 Fire Resistant Dock Seals Upon Request. GO GREEN THIS YEAR AND RECOVER YOUR DOCK SEALS! Often times, dock seal and shelter cover fabric specifications are based on some of the more expensive rubber based products that have been very heavily promoted by dock seal industry leaders. Although these fabrics have a good reputation, from a durability stand point the important factor is not whether the coating is rubber or vinyl, but the shear strength of the fabric. Known as Base fabric, the interwoven nylon or polyester strands sandwiched between the two layers of rubber or vinyl, is graded by the thickness and quality of the strands used in construction. For this reason knowing your material is as important as the quality of construction. On the market now there are common specified light duty base fabrics used in conjunction with expensive rubber coatings. Different coatings can feel very different offering a variety of benefits; however without the proper base layer a rather expensive product can perform at a much lower level than what is intended. The end result is a product with low durability and a high cost. Loading Dock Supply takes pride in ensuring our products are top grade industrial quality, we do not believe in cutting corners and strive to offer you the highest quality products and satisfaction. We also offer seals for Oversize Openings, Pit Levelers, Agricultural Operations, Livestock Load out, Pig Doors, Dairy Facilities, Grain Silos, & Lumber Mills, among many other unique applications requiring custom fit foam seals and curtains.